It’s generally thought that cats and dogs don’t get on, but that couldn’t be further from the truth. Both cats and dogs are complex creatures, but if they’re introduced in the right way, it could be the start of a beautiful friendship. At Wilko we’re proudly partnered with the RSPCA and their animal experts to help provide a helping hand – so read on to find out how to best introduce your four-legged friends! Why not introduce them straight away? All animals are different. Some cats don’t like change, and many felines are happier living without other pets in the house. How you introduce dogs and cats can make a real difference. Once a relationship breaks down and one of the animals feels threatened, it’s difficult to repair. 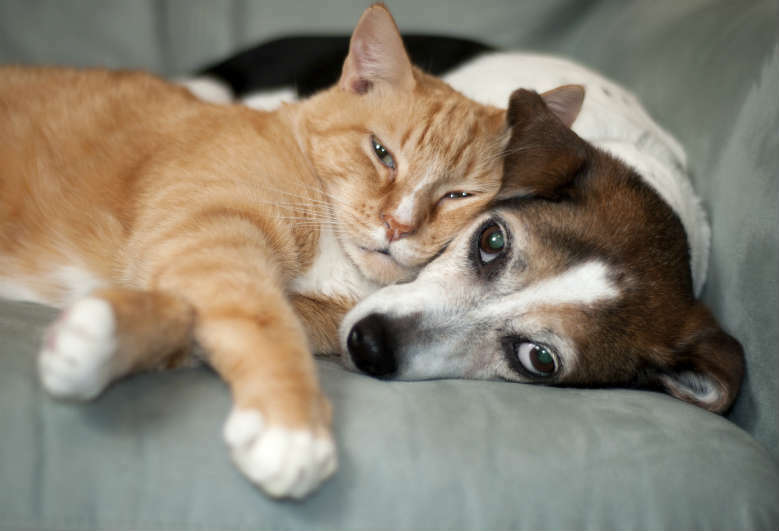 Even if your pooch has lived with a feline friend before, new cats may not necessarily be tolerated! If they are to become friends, it’s essential that the dog is not allowed to frighten the cat – or vise versa! Taking things slowly with a careful introduction is vital. Avoid parties and having family and friends over, and find time to concentrate on calm reassurance for both pets. A great way to integrate your new member of the family into the home is by ensuring that they smell of ‘home’ before being introduced – as scent is an important communication method for both cats and dogs. Gather scents from your new pet’s head by gently stroking with a soft cloth and dabbing this around your home and furniture to mix and spread the scents. It really can help! You may also wish to swap the bedding of your animals to enable them to smell each other before they meet. You could even stroke the dog and cat separately (without washing your hands) to exchange their scents. Let your new pet get used to the new smells of the house, and your other pet, before they meet. For this reason, it’s useful to delay the pets from meeting for a few days or even a week, if you can. During this time, keep them in separate areas of the house, but allow each pet to investigate the other’s room and bed without actually meeting. Tough to do, but well worth it! Whatever you do, don’t let the initial meeting deteriorate into a chase! The best way to avoid this is to use a kitten pen, puppy pen or large dog crate for initial introductions. Within the pen or crate you should provide your cat with somewhere to hide, such as a cardboard box or an igloo type bed. The pen should allow the pets to see each other, sniff through the bars and interact without any attack or intimidation. The bars allow them to be close together but provide protection at the same time. Place the cat or kitten in the pen/crate and let the dog come into the room. Give both animals attention and calm reassurance – you could even keep your dog on his/her lead, just in case. The dog should be kept as calm as possible on the lead and asked to sit quietly. Don’t forget to reward your dog with treats and praise for remaining calm! When both your four-legged friends are relaxed and calm with the controlled meetings, it’s time to let your pets meet without the pen/crate. Choose a room where the cat can escape behind furniture, jump up high, or hide if necessary. The cat should be given a safe position in the room, and the animals should be allowed to get used to each other gradually. Associate the presence of the cat with reward for your dog’s calm behaviour. Praise your dog for calm interactions, and use treats to reward them for being well behaved! Time to use the whole house! Once you’re sure they won’t fight or chase, start to use the whole house – the pets will probably find places to sleep and routines which allow them to live peacefully in the same house while gradually becoming used to and accepting one another. However, never leave the dog and cat together unattended until you’re happy that they’re safe together. Make sure that there’s enough space and that they can access all of their things (food, water, toys, litter tray) without coming into contact with the other pet if they don’t want to. By following these simple steps, and with a bit of patience, you’ll be giving your pets a great start to (hopefully!) becoming best friends forever.